Today's post can be found over at The Book Smugglers. 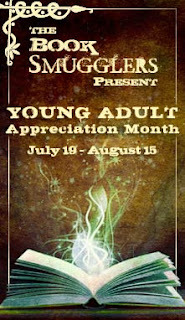 Ana and Thea kindly invited me to guest blog over there today as part of their most excellent Young Adult Appreciation Month. Come by and weigh in as we talk about young adult literature and why we read it and love it. Sharry, thank you so much! It's such a wonderful feeling passing on wonderful books and loaning out your own is particularly lovely because they have to come back and you get to talk to them. Also there's just something special about knowing your copy was the one they read first. Christine, you are so sweet. I'm glad.